A guide to the writers who have lived in or been influenced by Surrey. Although not drawn upon for this guide, a useful guide to the writers of Surrey, is The Hilltop Writers by Wilfred Robert (Bob) Trotter, which covers the Victorian writers based around Haslemere and Hindhead. Guildford Writers, a local writers circle, meet every alternate Tuesday evening at the Guildford Institute in Guildford. The Guildford Book Festival, now a major literary event, is an annual festival held in Guildford during the autumn. The 2008 Guildford Book Festival was preceded by the launch of the Guildford Big Read, which included giving away books by local author P G Wodehouse. Jane Austen (1775-1817), is thought of primarily as a Hampshire writer, who lived for a time in Bath and spent some time in Kent, but she did also spend a little of her life in Surrey. Jane Austen was familiar with the countryside around Dorking and Leatherhead. Her unfinished novel, The Watsons , was set in Dorking. What many regard as Jane Austen's greatest novel, Emma (1816), was written whilst she was staying in Great Bookham in 1814. It was not just that she wrote it at Great Bookham, it provided inspiration and setting for Emma , the picnic outing to Box Hill, for example. Jane Austen was influenced by Fanny Burney. James Barrie (1860-1937) lived in Black Lake Cottage - a remote woodland retreat near Tilford. The adventures he and his sons had in the woods were the inspiration for Peter Pan (1904). The Black Lake Pond became a South Sea Lagoon. As part of Guildford Summer Festival 2004, the Ivonne Arnaud Theatre put on a musical production of Peter Pan to celebrate the 100th anniversary of the first stage performance of Peter Pan . French-born British poet, historian, Catholic apologist, and essayist, Hilaire Belloc (1870-1953), died in Guildford. Hilaire Belloc is best remembered for his light verse, particularly for children, and for his essays. His works include Verses and Sonnets (1895), The Bad Child's Book of Beasts (1896), The Modern Traveller (1898), Mr. Burden (1904), and Cautionary Tales (1907). He also wrote several historical works,including a four-volume History of England (1925–31). Novelist Irene Black, author of The Moon's Complexion (2005) and Darshan (2007), lives in Guildford. Writer Louis de Bernières (1954- ) grew up in Surrey, his name is from a French Huguenot ancestor. He is best known for his fourth novel, Captain Corelli's Mandolin (1994), for which he was awarded the Commonwealth Writers Prize for Best Book. A Partisan's Daughter (2008) was shortlisted for the 2008 Costa Novel Award. He also performs with the Antonius Players. Fanny Burney (1752-1840), author of Evelina , Cecilia and Camilla , met her future husband whilst staying with her sister at Mickelham. She and her husband lived for a while at Mickelham before moving to Great Bookham. Camilla was written at Great Bookham. It draws heavily on the world around her. Fanny Burney was one of the writers to influence Jane Austen. Lewis Carroll (1832-1898), in real life, the Oxford Mathematics Lecturer (1855-81), the Rev Charles Lutwidge Dodgson, or to his many young friends who knew him personally, Mr Dodgson, author of Alice's Adventures in Wonderland and Through the Looking Glass , is Surrey's best known and loved writer. The recently arrived Victorian railway meant Lewis Carroll could live in Guildford and work in Oxford. His house, The Chestnuts, where he lived with his sisters, is located just outside Guildford Castle. It is still a private house, and apart from a plaque designed by local school children, there is nothing to indicate this to be the house of Lewis Carroll. The nearby Guildford Museum, has a permanent exhibition dedicated to the life and work of Lewis Carroll. Lewis Carroll died in Guildford (14 January 1898). He lies buried in The Mount Cemetery, Guildford. William Cobbett (1762-1835), farmer, pamphleteer, radical, social commentator, started out in life as a crow-scarer and ploughboy. As an assiduous student he mastered French, rhetoric, geometry, logic and fortifications. Cobbett joined the army when he was 21 but had to flee to America in 1791 after making accusations of military corruption. Cobbet was the original publisher of Hansard , a guide to Parliamentary proceedings, then known simply as the Register. William Cobbett is best known for his Rural Rides (1830). His social observations and commentary, extracted from the Register, are the best insight we have today to social conditions during his lifetime. Cobbett's Cottage Economy , originally published as a series of pamphlets (1821-2), was first published as a book in 1822, followed by a series of revisions and enlargements, the 17th edition was published by Cobbett's wife Anne (1850), to which G K Chesterton added a preface (1916). Cobbett was born in Farnham, Surrey. Near the River Wey, not far from the Farnham Maltings, lies The William Cobbett, formerly The Jolly Farmer (renamed in the 1970s in honour of William Cobbett), home of William Cobbett. At the time of Cobbett's birth (1762) it was a farmhouse. The William Cobbett contains a framed copy of the Political Register, the political journal founded by Cobbett. Opposite The William Cobbett, on the far bank of the River Wey, in Gostrey Meadow, can be found a small bronze bust of William Cobbett by Willi Soukop. Sir Arthur Conan Doyle (1859-1930) is best known for his Sherlock Holmes stories, probably the best known detective in the world. Much as Holmes preferred the grim, crime-ridden streets of London, and intensely disliked the countryside, he and Watson were often found sharing a compartment on a train, speeding into the darkest depths of the Surrey countryside. One such case, Holmes is called upon to solve, 'The Adventure of the Solitary Cyclist', features Crooksbury Hill, a prominent sandy outcrop overlooking Farnham. Conan Doyle lived at Undershaw, now a hotel, close by the Devil's Punchbowl. Visitors to Undershaw included H G Wells. Two of Conan Doyle's adventure novels, Sir Nigel and The White Company , are set in Surrey. Daniel Defoe (1660-1731), author of Moll Flanders and Robinson Crusoe was educated at a boarding school in Dorking. He mentions Surrey in his Tour Through the Whole Island of Great Britain . Charles Dickens (1812-1870) was an occasional visitor to Surrey. Dickens stayed at the White Horse Hotel in Dorking. The Marquis of Granby Inn, in the Pickwick Papers may have been based on the old King's Head in Dorking. The coachman in the Pickwick Papers is believed to have been based upon a Dorking coachman. Nicholas Nickleby and Smike passed through Hindhead in Nicholas Nickleby . Towering above the Devil's Punch Bowl is Gibbet Hill, between the two snakes the A3, the London to Portsmouth main road. Running higher than the present main road, over the top of the hill is the old coach road. It was along this road that Nicholas Nickleby and Smike passed. They stopped to read an inscription on a stone, the Sailor's Stone, which marks the spot where a foul murder took place. Close by the stone is a granite cross erected by Lord Justice Earle to mark the summit (1851). Associated mainly with the Midlands, George Eliot (1819-1880) regularly visited the Crosses, home of her future husband in Weybridge. With her lover, George Lewes, George Eliot explored the countryside around Dorking during the 1860s. It was during this period she wrote Romola . George Meredith was a regular visitor. In 1871, George Eliot retreated to Shottermill to write Middlemarch . The following year she returned to Redhill to continue her work on Middlemarch . In 1876, she bought The Heights in Whitley, where she lived with Lewes. On his death, she re-married John Cross, The Heights was kept on as a summer residence, but as she died Christmas 1880, they only spent a single summer there. E M Forster (1879-1970) used to visit Surrey as a child when he visited his aunt at Abinger. He later lived at West Hackhurst and spent forty years of his adult years in Surrey. Forster lived at Monument Green, Weybridge. It was here that he wrote A Passage to India (1924). In the year in which A Passage to India was published, Forster inherited the lease to West Hackhurst. He lived here until 1946. Room With a View (1908) was written before Forster lived in the Surrey Hills. The bathing scene with Lucy Honeychurch, is believed to be a pond at Holmbury St Mary, and the village of Summer Street, Holmbury St Mary. Aldous Huxley (1894-1963) was born in Godalming, his father taught at nearby Charterhouse School. The family lived in Compton. 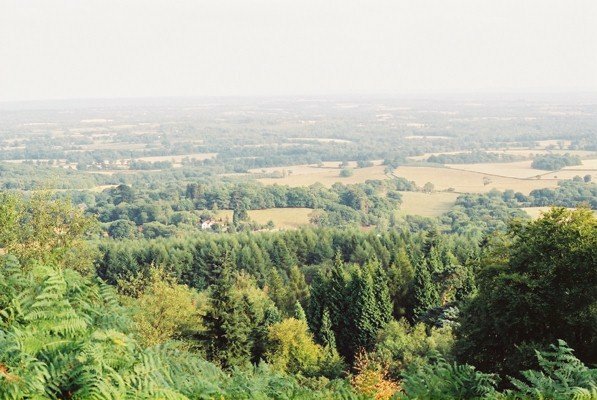 Huxley loved to cycle in the Surrey Hills, especially around Hindhead and the Devil's Punchbowl. He went to Eton and Oxford. His best known novel is Brave New World (1932), a chilling account of the future. Huxley spent his latter years in California, where he died in 1963. In 1971, the ashes of Aldous Huxley were returned to England and interred in the family grave at the Watts Cemetry, Compton, near Guildford in Surrey. A Booker Prize finalist for Orchard on Fire (1996). Shena Mackay (1944- ), lived for a while in the Dorking area, also at Reigate, where she worked for a brief period in Reigate Library. Poet, philosopher, theologian, environmentalist Alwyn Marriage has published five books, two on theology, three are collections of poetry. Her latest collection of poetry is entitled Touching Earth . She lives in Guildford. George Meredith (1828-1909) lived at Flint Cottage on Box Hill. Regular visitors to the cottage were Robert Louis Stevenson and J M Barrie. George Meredith died at Flint Cottage and the cottage was bequeathed to the National Trust. The National Trust, failing in its duty to protect our national heritage, has subsequently sold Flint Cottage on a 99 year lease. George Meredith known in his day as a poet, is today regarded as a novelist, principally for The Egoist . John Osborne (1929- ) was one of the original 'angry young men' . He burst onto the English stage in the 1950s with two plays which are typical of the genre – Look Back in Anger (1957) and The Entertainer (1957). Osborne's plays were characterized at the time for their gritty realism. Listening to The Entertainer , broadcast in the early hours of the morning (Sunday 5 June 2004) by the BBC World Service, the words that came to my mind, half a century later, were 'highly contrived and artificial, and extremely boring'. Osborne long sank into obscurity, to be occasionally wheeled out as one of the original angry young men. He staged a comeback with with Deja Vu (1992), a sequel to Look Back in Anger , premiered at the Thorndike Theatre in Leatherhead. Osborne grew up in Ewell, and was educated at Ewell Boys' School. He drew upon his dysfunctional family for much of his material. He also lived in Stoneleigh. On the banks of the River Wey, in the countryside just outside Farnham, lie the ruins of Waverley Abbey, once a Cistercian Abbey. It was Waverley Abbey that inspired Sir Walter Scott to write the Waverley novels. Educated at Farnham Grammar School, George Sturt (1863-1927) was a businessman who spent all his life in either Farnham or Lower Bourne. He immortalised the family business in The Wheelwright's Shop (1923). The family wheelwright business was located in East Street in Farnham. The family business was founded in Farnham in 1706. At the time of his writing, it had been in business for 110 years, but Sturt recognised that with the coming of the motor car, the family business was drawing to an end. In addition to The Wheelwright's Shop , Sturt wrote a series of books and pamphlets in which he recorded his observations on the world around him. A permanent exhibition on Sturt can be found in Farnham Museum. Jonathan Swift (1667-1745), writer, satirist, political pamphleteer, author of Gulliver's Travels , was born in Ireland, educated in Ireland and spent much of his life in Ireland, but did spend a part of his life in Surrey. Swift served his political apprenticeship under the Whig statesman, Sir William Temple. Swift was secretary to Sir William at Moor Park, Farnham 1689-1694, 1696-1699. The intervening years Swift spent in Ireland, where he was ordained and received the small prebend of Kilroot. On the death of Sir William, Swift returned to Ireland, where he was given the prebend of St Patrick's, Dublin. It was at Moor Park that Swift met his beloved Stella to whom he dedicated his journal. Moor Park is a large house just outside Farnham, situated just below the North Downs in the valley of the River Wey. Gulliver's Travels , is Swift's blistering satire on the corrupt English establishment. Looking at politics today, we see little has changed. Besides Gulliver's Travels (1726) Jonathan Swift's works include, The Tale of a Tub (1704), The Battle of the Books (1704), Journal to Stella (written 1710-11). Gulliver's Travels was the only work for which he was paid, for which he received the princely sum of £200. Esther Johnson, called Stella by Swift, was the daughter of the housekeeper to Sir William Temple at Moor Park. Swift first met her when she was eight and taught her to read. She was the love of his life. Swift was a generous man, a third of his income went to charity, another third went to establish a foundation for the insane - St Patrick's Hospital for Imbeciles (opened 1757). Whilst he had political authority he used his position to advance the cause of those less fortunate than himself. In the last years of his life Swift slowly went mad, and in his last years his affairs had to be handled by a trust. Swift died 19 October 1745, and was buried side by with his beloved Stella in St Patrick's Cathedral, Dublin. Following his move from Sheen, Sir William Temple lived at Moor Park on the outskirts of the ancient market town of Farnham (Surrey, England). Today, Moor Park is in need of repair and appears to house some form of training establishment. The North Downs Way runs nearby. A public footpath runs through the grounds of Moor Park, parallel to the River Wey, and eventually leads to the ruins of the Waverly Abbey, a Cistercian Abbey that inspired Sir Walter Scott to write the Waverley novels. The footpath runs past caves thought to have once been inhabited by the witch Mother Ludlam. Alfred Lord Tennyson (1809-1892), a poet usually associated with Lincolnshire, lived in a house, Aldworth, on the slopes of Blackdown. Flora Thompson (1876-1947), is best known for her semi-autobiographical Lark Rise to Candleford (1945), the story of three closely related Oxfordshire communities – a hamlet, the nearby village and a small market town – which she brings to life through the childhood memories and youth of 'Laura'. A long-lost world of rural Oxfordshire. A world that was on the decline then, and has long since vanished. Although these days published as a single volume, Lark Rise to Candleford is a trilogy, and was originally published in three parts as Lark Rise (1939), Over to Candleford (1941), and Candleford Green (1943). According to census data, Flora Thompson was at Yateley, Hampshire, working in the Post Office in March 1901 – her occupation given as 'Post Office Clerk' – living with the sub postmaster William Bettesworth and his wife and their servant. The same census data tells us that her husband to be, John Thompson, was working as a Post Office Clerk at nearby Aldershot. Flora lived in Oxfordshire, later Devon, but in between times she lived at Grayshott (1898–1901), on the Surrey-Hampshire border not far from Haslemere, where she was employed in the village post office, as assistant sub-postmistress. It was during her time at Grayshott as assistant sub-postmistress, that she came into regular contact with Sir Arthur Conan Doyle and George Bernard Shaw. There have been several dramatisations of her life and work. The most noticeable being a performance of Lark Rise by the New Farnham Repertory Company (July-August 2000). The Redgrave Theatre rose from the ashes in July and August 2000, in a marquee in the garden of Farnham Library, and Lark Rise was the opening production. Two other productions have been community play projects on the Surrey-Hampshire border in the late 1990s. The Redgrave Theatre in Farnham was the only theatre worth visiting in Surrey. The local council refused to continue its funding. It has since been demolished for a Sainsbury's supermarket. 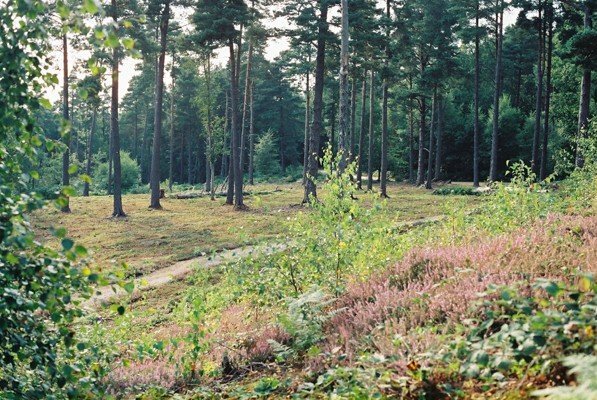 Flora's Trail takes you from Grayshott to Griggs Green and back, through the countryside which Flora loved. 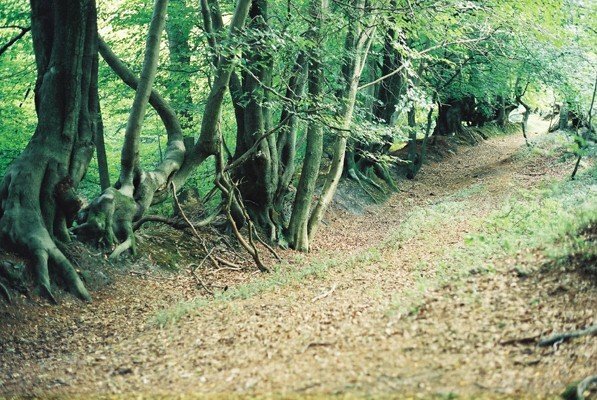 An alternative 6-mile circular walk from Griggs Green, prepared by Anne Mallinson, is available from East Hampshire District Council. The Hilltop Writers: A Victorian Colony among the Surrey Hills by Bob Trotter, provides details of 66 writers who worked around Haslemere and Hindhead in the last few decades of the 19th century when Flora worked nearby at Grayshott Post Office, including Sir Aurther Conan Doyle and Bernard Shaw who both visited the village post office. Grayshott lies on the Hampshire side of the Surrey-Hampshire border, but it is unusual in that the church parish straddles the border. H G Wells (1866-1946) lived in Woking for a couple of years with his second wife Amy. The two of them used to take trips on cycles exploring the country lanes. The Wheels of Chance , The War of the Worlds (1898), The Invisible Man (1897) and the opening chapters of Love and Mr Lewisham (1900), were all written during his 18 months stay at Dorking. The Wheels of Chance draws heavily on his cycling around the local lanes. The War of the Worlds opens on Horsell Common, a common just outside of Dorking. 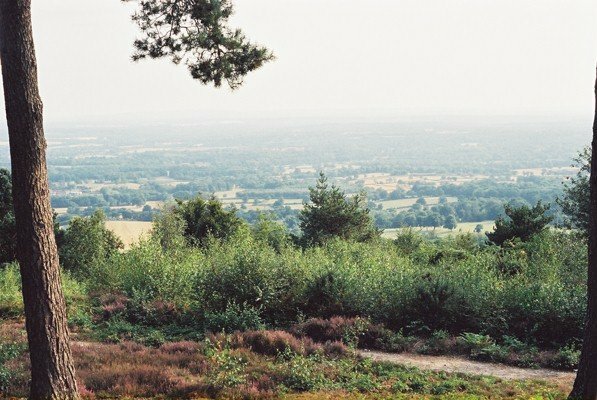 Surrey is renowned for its many open heaths and commons. It is at Horsell Common where the Martians land. When Orson Wells broadcast an adaptation of The War of the Worlds , it caused widespread panic. Similar broadcasts have caused similar panics. P G Wodehouse (1881-1975), was born in Guildford. P G Wodehouse is best known and loved as the creator of Bertie Wooster and his faithful manservant Jeeves. The quintessential picture of English upper class society. As well as the author of numerous tales about Jeeves and Bertie Wooster, P G Wodehouse also wrote film scores and collaborated with Jerome Kern and George Gershwin. As a celebration of P G Wodehouse and to coincide with the National Year of Reading the Guildford Big Read was launched June 2008 by giving away free copies of his books at the Electric Theatre. Other events included Pig Racing! The idea was to get everyone reading his books before the Guildford Book Festival (16-24 October 2008). I was inspired to create this page having visited an exhibition on Surrey writers at the Guildford Institute in Guildford (June 2004). What struck me about the exhibition was the complete absence or lack of prominence for important or influential writers whilst at the same time giving great prominence to relatively unknown scribblers or scribblers of little or no merit.